DPD Private- Delivery to the Czech Republic 30.04. DPD - Delivery to the Slovakia 01.05. DPD - Delivery to Germany 01.05. DPD - Delivery to Poland 01.05. DPD - Delivery across Europe 03.05. GLS - Delivery across Europe 06.05. PPL - Delivery across Europe 06.05. 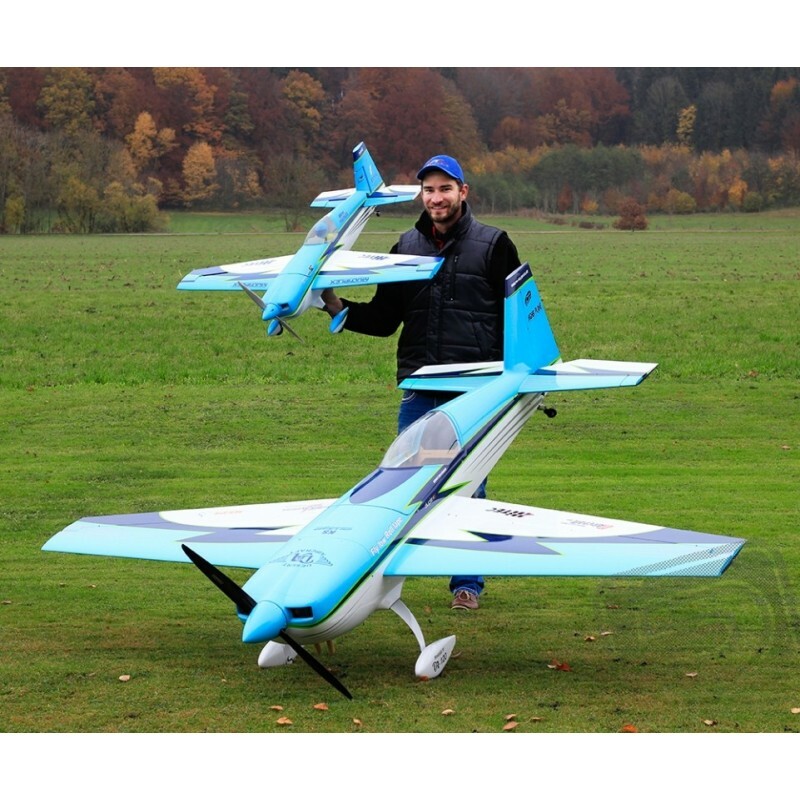 When designing the newest member of the family tradition of great models from foam Elaporu joined forces with a top team multiplex pilot and designer Gernot Bruckmann, with designer Mirco Percorarim and company Extra Aircraft. Combined with the experience of a world champion in aerobatics 3D high-tech construction foam models supported by one of the world's top manufacturers of real planes and creativity crowned champion of industrial design ... born Extra 330SC, beefy brute 3D purebred freestyle acrobatics that will please everyone experienced pilot! The fuselage is made of foam ELAPORu with "multiplexácky" sophisticated internal reinforcement structure made of plywood, laser-carved parts providing the model with low weight necessary strength. Structure forms the "backbone" of the model; supports the motor, controller, drive battery and chassis. Brushless motor Permax BL-O 3520-0920 regulator MultiCONT BL-55 S-BEC drives the propeller 14x7 "with precision plastic cone is mounted in the nose of the rear mounting. On top of the fuselage is a removable cover (on hold magnets) of the battery, receiver and servos rudder and elevator, which includes a transparent canopy cockpit indicated the seat and the dashboard. Servo rudder and elevator are located in an area controlled by the rudder and the cables. Two-piece wing is symmetrical profile is made of foam ELAPORu; having a light chamber structure with a main beam formed carbon tube. The halves are joined using the carbon tube and place to provide a special latch. Aileron servos are installed; ailerons are controlled by short wire rods. The tail surfaces are also made with a lightweight ELAPORu chamber design with internal balsa reinforcements for the hull are fixed with plastic pins and screws. All helm (including wings) are to ensure accurate and smooth operation suspended on a flexible or hinge joints. Landing gear is a solid two-wheeled chassis with carbon legs and steerable wire spur coupled with the rudder. Finishing the model is already completely finished with color spray and stickers in a special limited edition Gernot Bruckmann with original logos Extra Aircraft (author Mirco design Percorari). To supply power unit model, you'll need a LiPo battery with a capacity of 2600-2700 mAh and a loading capacity of at least 35 C.
To control model basically just the normal four-channel radio system, to exploit all of the model is optimal to use at least a six-channel computer radio system with dual and exponential variations and mixes. The manual for the recommended size of excursion for classic aerobatics F3A, 3D aerobatics and extreme 3D aerobatics (including special mixes, which likes to use Gernot Bruckmann). ARF consists of: assembled fuselage with installed motor, controller and two servos, ready-made wings with 2 servos, the tail of ELAPORu, propeller with a plastic cone, solid carbon chassis with wheels and aerodynamic covers, a carbon tube coupling wings, a set of small accessories and instructions. 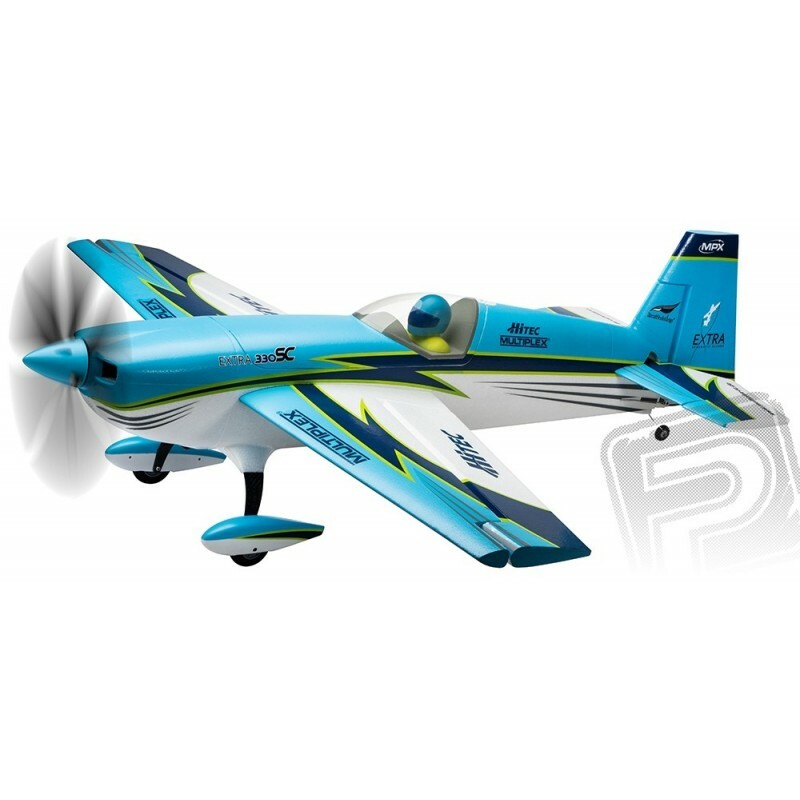 MULTIPLEX # 214274 EXTRA 330SC powerplant kit includes: Permax BL-O 3520-0920 AC motor, MULTIcont BL-55 S-BEC controller and 14x7 "propeller. 713342 plastic screws M5x60 10pcs"